This page is about the American naval fighter F4U-1D. For other uses, see F4U (Family). The F4U-1D Corsair is a rank III American naval fighter with a battle rating of 3.0 (AB) and 3.7 (RB/SB). It has been in the game since the start of the Open Beta Test prior to Update 1.27. The F4U Corsair is a very distinct aircraft with its famous gull-wing design and huge R-2800 Double Wasp engine. 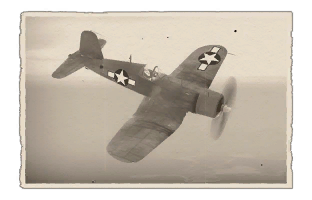 The general play style of the F4U-1D is like any Corsair, climb high, only Boom-and-Zoom, never turn-fight and keep your energy high. Even though the F4U-1D can carry a considerable bomb load, in air RB, bringing any secondary load-out is a mistake and most likely will get you killed. Due to its great energy retention and high dive speed, the Corsair is very good at Boom and Zooming. It is recommended to be used this way especially against any Japanese planes. Against any German planes Boom & Zoom is still recommended, but some planes you can out turn, such as the Fw 190 A-4. As with every American fighter, always climb at the start of a match. The only way to be successful with this plane is to climb high and end up higher than the enemy. Using this tactic will greatly increase your chances of getting air kills and forcing the enemy down low where you can finish them off. When you are diving on a Japanese plane and it turns around, do not follow it in the turn to get a couple shots off. Instead pull an Immelmann turn, and you will end up right on the tail of an opponent with a lot less energy while you still have a lot. The same tactic can work against German aircraft to an extent as well. 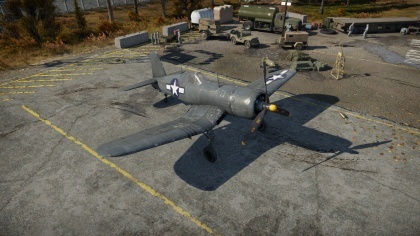 Suitable for both dog-fighting as ground attacking the Corsair fulfils many roles. With 8 rockets a great variety of targets can be taken care of. Four tanks of any size, if aimed well, four light pillboxes, or a single destroyer. 2,000 lbs (~1,000 kg for in game purposes) deliver enough punch for 2/3 of a strategic base, or 1/2 Japanese Carrier. Hands-off carrier take-off (Auto engine control, no secondary weapons): Ignite engine, flaps: raised, elevator trim: 20%, aileron trim: 11%, rudder trim: 6%, WEP throttle, hands off controls until you get lifted off the ground. When facing the Japanese, you always have to look out for A6Ms, Ki-61s, and Ki-43s. Against all past mentioned you should never turn-fight them, boom-and-zoom each and let your superior speed, energy retention, and dive speed save you. When facing the Germans or Italians, you have to be wary of Bf 109 F-4's and Bf 109 G-2's, each will out climb you, out gun you, and accelerate faster than you. The best way to counter a 109 is to jump one that is on an teammate's tail, and pour your 6 x .50 cals into them. Unlike the Japanese planes, a 109 can take a lot of hits, and its fires can go out as well, so be wary. You do not have to worry much about Fw 190's, the only thing worth mentioning is to never head-on one, and if you do happen to get one on your tail, either out dive it or turn-fight it. The best counter measure against the F4U-1D is to out climb it. If you do then it will be a sitting duck. If you are at the same altitude as it, try to engage it in a turn-fight if you have more energy than it (be mindful, a skilled pilot can make his F4U-1D out-turn the agile Bf 109 F-4). Constant turning will cause plane to lose speed and energy quickly. The F4U-1D Corsair is a navy plane that began service in April of 1944 with the U.S. Navy. This model of the Corsair was moved to aircraft carriers in Dec. of 1944, and participated in famous battles like the Philippines Campaign, the Battle of Iwo Jima, and the Battle of Okinawa. This rugged warbird also participated in escorting bombing raids conducted on the Japanese mainland until VJ day, on Aug. 15th 1945.